Auction script is one of the hottest businesses on the internet. After the success of online business concept, many people would like to buy and sell new and used goods and products through online. These auction sites provide a common place where the bidders and auctioneers can bid and sell any kind of products. Our entrepreneur bidding auction script has different kinds of functionalities, so the user can experience in buying the product at a reasonable market value. This site has classic and user-friendly design, easy navigation with-in the website and multiple bidding option and it is 100% customizable to suit your business concept accordingly. So, it is the perfect go-to script for start-up entrepreneurs. We have developed this script by lending certain necessary functionalities from eBay, Amazon and other popular auction sites. We are aware of the fact that we don’t have all the functionalities but we have developed it after an extensive market research by our business analyst team by carefully hand-picked functionalities that are required for a start-up and mid-level entrepreneurs. The website has multiple features such as multi-vendor commissions that can be controlled by admin, detailed report for the vendor and the administrator, high secure coding and PayPal gateway integration. We have put in a great deal of time and effort into creating a great auction script, so you don’t have to waste the man-power and money to develop a website from the scratch. Once the payment has been made the site will be up and running within 24 hours. It is a onetime investment with lifetime revenue. It is highly SEO-friendly with Google optimization which makes it more visible on the search engines and increases the rank in the internet. Advance search option, Category management, Product management, Bid option, Bid management, Direct buy option, Wish List, User management, CMS Management. Hello, One of script which is needed who is like to start the online selling business and I used for the same purpose. Response from visitors is more I expect. I am using this script for my online shopping and it makes my business to rich level. User interface is superb. 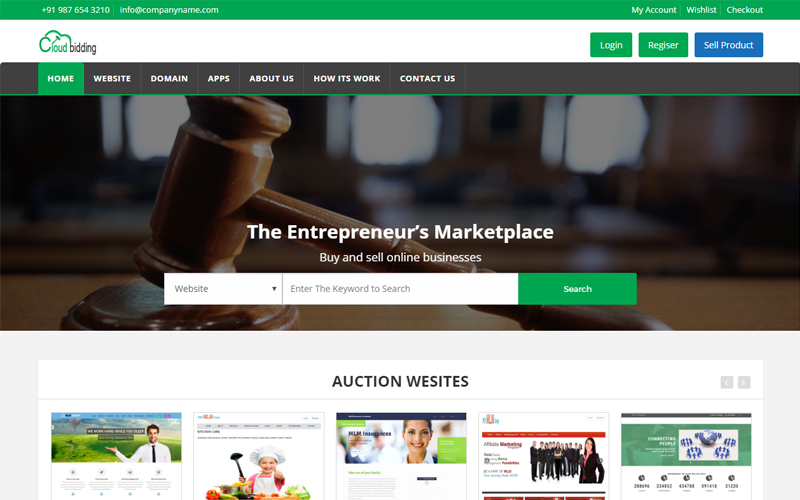 Entrepreneur website auction script is perfectly suits for my online marketing. Thumbs Up for the script and the team.